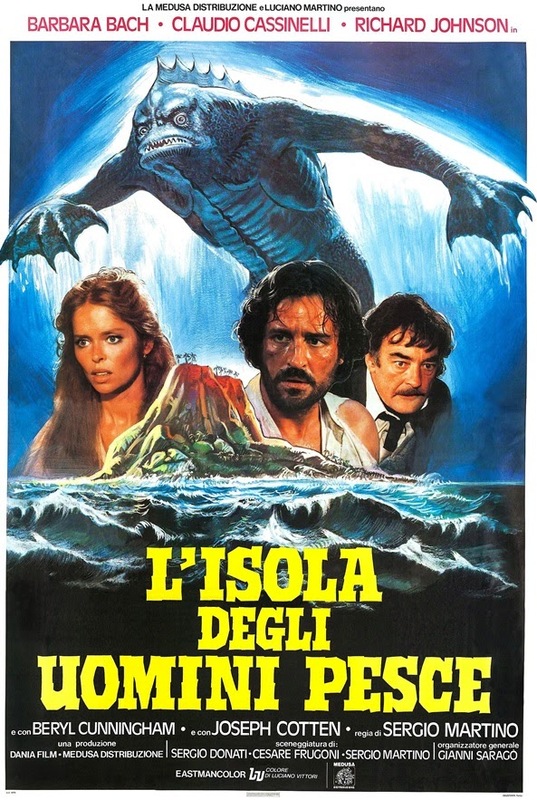 Sergio Martino's L'isola degli uomini pesce (or ISLAND OF THE FISHMEN) was an old-fashioned fantasy-adventure involving a shipwreck survivor, a mad doctor, upright-walking fish men monsters and the treasure of the lost city of Atlantis. It was very light on exploitation elements and violence, and could easily be viewed by older children (I could imagine it getting a PG rating here in America), so when it came time for its U.S. release the new distributors decided to do something about that! 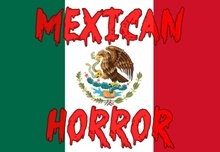 After the rights were purchased, the film fell into the hands of Roger Corman and his New World Pictures. 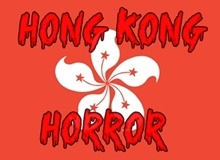 Fully aware of what was selling tickets in the early 80s (horror, gore, exploitation and hack-n-slash flicks), Corman had the film partially re-dubbed, removed around 30 minutes of footage and then hired Miller Drake (some advertising materials credit him as "Dan T. Miller") to film all-new footage (less than 20 minutes worth) to add to the original film in place of the omitted footage. 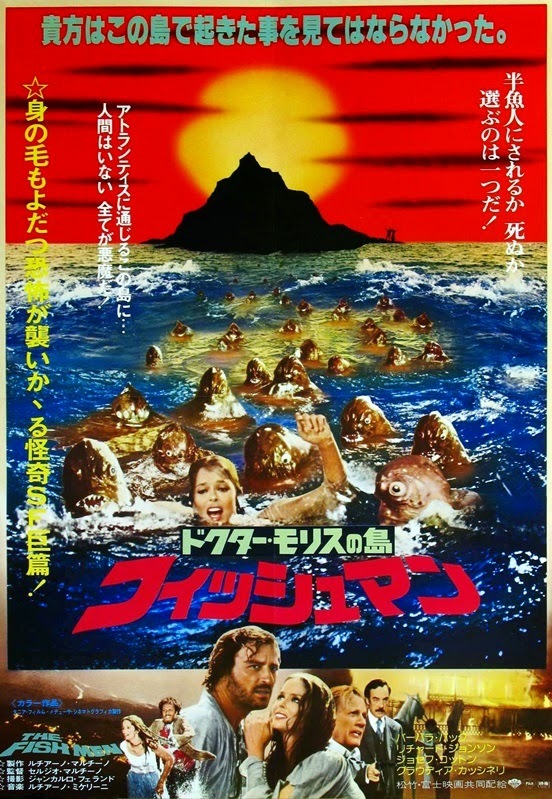 The bulk of the new footage was a 12-minute-long prologue placed right at the beginning featuring four people arriving at an island only to be slaughtered in gruesome ways by a sea monster. Other gorier inserts were also spliced in at various points so this could be marketed as a horror film. This new version opens somewhere on The Caribbean Sea in 1891 as a boat arrives on a foggy island (actually the ever-popular Bronson Caves in California). Pipe-puffing Captain Decker (Cameron Mitchell) has brought gambling-indebted James Radcliffe (Mel Ferrer) and his wife Samantha (Eunice Bolt) there so they can search for a rumored treasure. Decker leads them to entrance of "The Cave of the Dead," which the natives claim is haunted by ghosts, but otherwise refuses to take part in their hunt. James and Samantha wander into the caves, discover some bug-infested skeletons and find bits of the gold they were searching for. Meanwhile, waiting by the boats, Decker's assistant (Tom J. Delaney) has his head ripped off by a sea monster. The monsters then slaughter the other three, with brief-but-bloody close-up shots of a throat and stomach being clawed open. Hey, they even manage to throw a skull-faced zombie into the works. Why? Well, I guess the answer is: Why not? 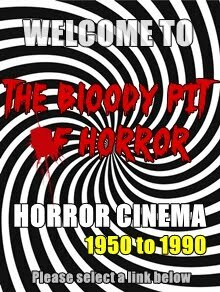 They've just successfully managed to add atmosphere, gore, slime and shocks to turn the original into more of a horror / slasher flick, so mission accomplished. Footage from the original film then begins with doctor Claude de Ross (Claudio Cassinelli) and the other prisoners trying to find their bearings on the island they've just shipwrecked on. About 18 minutes in, we cut to another newly added scene which lasts about a minute. This one features another of the shipwreck survivors (James Alquist) awakening on the rocks, stumbling down to the beach and discovering an overturned boat. Inside he finds a slime-covered corpse and then turns around only to get clawed in the face by a slimy monster hand. Afterward we return to the original film for a spell as Claude encounters power-crazed Edmond Rackham (Richard Johnson), Amanda (Barbara Bach), who is introduced as Edmond's wife but really isn't, and Amanda's ill father, Professor Ernest Marvin (Joseph Cotten). Numerous scenes from the original have been shortened or removed entirely - including most of the subplot involving Edmond's voodoo-practicing assistant Shakira (Beryl Cunningham) - and every once in awhile they splice in a new close-up shot of a monster's eye. The final and last major changes occur when Claude and Amanda find her father's hidden lab. In the original, there were numerous shots of real fish swimming around in tanks followed by the discovery of a half man / half fish creation. That has all been tossed out for new effects shots. The fish in tanks have been replaced by an octopus and a few puppet monsters and the gilled man strapped down has been replaced by an all-new creation designed by Chris Walas. The new creature design is actually excellent and looks about 100 times better than the creatures from the original version, which makes one wish it had been the star of an entirely new film! While the original isn't a terrible film as is, some viewers will no doubt prefer this altered version. 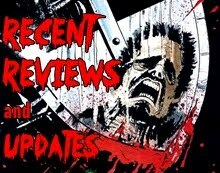 It tells the same exact story as the first in a much more compact fashion but it also steers it away from family friendly fantasy into the realm of adult horror with the new footage and gory inserts. 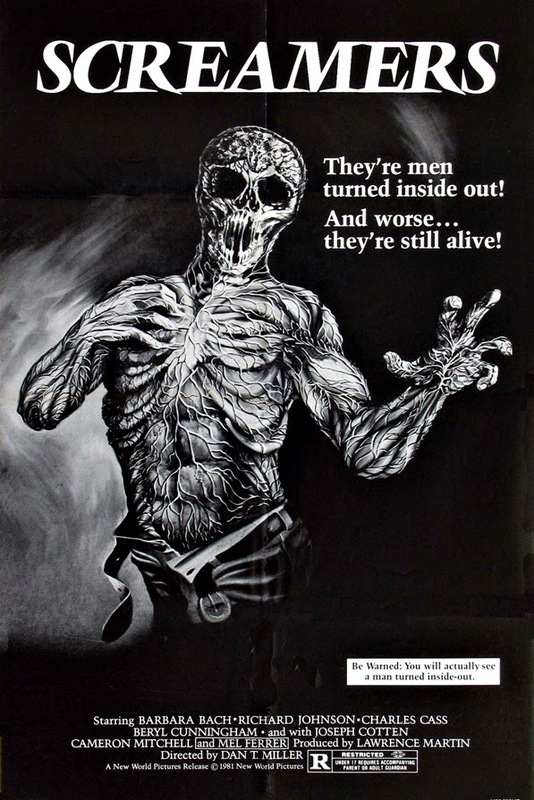 After all was prepped and ready, this new version was released to theaters briefly in 1980 under the title Something Waits in the Dark, where it flopped. Intent on reclaiming the investment, Corman then had Jim Wynorski whip up a new ad campaign, which memorably though falsely promised viewers they'd actually see a man being turned inside out. A new trailer was also made by Wynorski, which featured an actress not even in the film as well as various goopy creatures also not seen in the film. It was re-titled Screamers, reissued theatrically in 1981 and ended up doing much better. The Embassy home video release used the same marketing ploy and also did well. New opening and closing credits were also prepared for this release, which show that Joe Dante (who was the associate editor and took the amusing alias "Giuseppe Dantini"), Gary Graver (DOP of the new footage) and Gale Anne Hurd (location manager) also worked on this. Just last year, Screamers was finally issued in pretty pristine form by Scorpion Releasing. Their Blu-ray release also contains several misleading trailers (one utilizing footage from Humanoids from the Deep! ), interviews with Corman, Drake, Wynorski, Dante and New World editor / production supervisor Clark Henderson and other goodies. 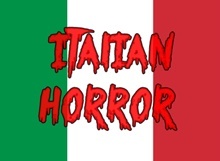 Note: This review is for the original Italian version, filmed in 1978 and released theatrically in Italy in January, 1979 with a running time of around 99 minutes and not the later, revamped, shorter version released here in America by Roger Corman's New World Pictures under the title SCREAMERS. Since there are significant differences between the two films, I'll be reviewing them separately here. In 1891, a prison ship is battered and sunk by something in the water. Most of the men are killed, but the few survivors find themselves on a nameless, uncharted tropical island with an active volcano on it. Claude de Ross (Claudio Cassinelli), a lieutenant and medical doctor on the ship, locates one of the prisoners - the injured José (Franco Iavarone) - on the beach and the two decide to head inland to look for water. Several other prisoners; crazy old-timer François (Franco Mazzieri), the dangerous and untrustworthy Peter (Roberto Posse) and Skip (Giuseppe Castellano), turn up, the men find fresh water and then François wanders off to look for food and turns up dead. Writing it off as an alligator attack (amusingly, Martino next made The Great Alligator featuring most of the same cast), the other men continue on. After Skip falls victim to the old spiked pit booby trap, the three survivors stumble upon an empty village with empty graves and signs that voodoo ceremonies have been conducted there. The beautiful but unfriendly Amanda (Barbara Bach) shows up on horseback to try to warn the men away but, starving, they follow her back to her home, anyway. There, they meet Edmond Rackham (Richard Johnson), who wonders what they're doing on his island. Edmond's the type of guy who gets off on his power trip of being a big fish in a small pond, or as he likes to put it, "absolute master." He's more or less enslaved the remaining inhabitants of the island, who do his bidding, and likes to shout things like "I am the law!" when confronted with any kind of opposition. Amanda hates him. He's controlling, abusive and instantly jealous of Claude, whom he (rightfully) suspects is going to fall for her and vice versa. Still, he allows the men to stay, making an aside to Amanda that they won't be there for very long. In Peter and Jose's cases that turns out to be accurate as each are soon killed off. The only reason Claude is spared is because he's a doctor and of some use. While nothing spectacular, this is a perfectly acceptable and enjoyable juvenile fantasy / adventure / monster movie very much in tune with the writings of Jules Verne and H.G. Wells (most notably the latter's "The Island of Dr. Moreau"), with a dash of H.P. 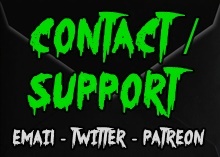 Lovecraft and Creature from the Black Lagoon thrown in there as well. Production values are quite good for a film of this type, with nice photography, music and art direction. It was shot in some really beautiful locales, near where Lucio Fulci's Zombi 2 (also starring Johnson) was filmed. The cast - also including Beryl Cunningham as the Haitian voodoo priestess / servant Shakira and an unbilled Bobby Rhodes (who'd later get some attention playing "Tony the Pimp" in Demons) as one of Rackham's henchmen - is decent and the dubbing isn't terrible for a change. The monster suits / masks designed by Massimo Antonello Geleng aren't all that impressive but I've definitely seen far worse. And the build-up actually does end up going somewhere as the big finale is exciting and action-packed enough. If there's any major fault, it's that the story is slow-moving in spots and takes one too many detours in telling its simple story. The voodoo elements, for instance, really have little to do with the rest of it and the telepathic link Amanda shares with the creatures isn't fully realized. The original, non-tampered-with Italian version was unavailable in America for quite some time, though in 2009 it finally made it to DVD from Mya Communication. 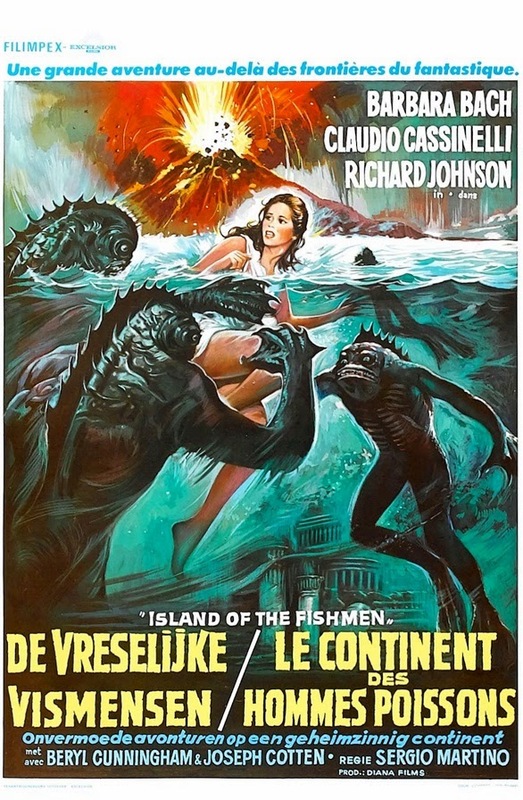 The UK video release (under the title Island of Mutations) from Vipco appears to be the original Italian cut, as does the VHS release (titled The Fish Men) on the Dutch label EVC. Fish Men was also the release title in Japan. Martino followed this up with the belated, barely-released sequel La regina degli uomini pesce ( aka The Fishmen and Their Queen) in 1995, which blends fantasy, horror and post apocalyptic sci-fi and is rumored to be pretty awful. 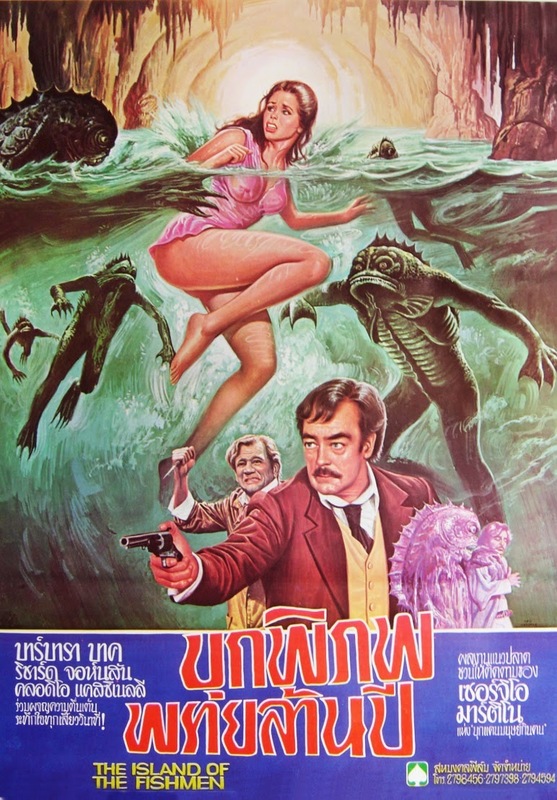 In Germany, both of Martino's fish-man films were issued on one set.